...that the Prophet of Restraint was involved in a major sexual scandal that jeopardized his position and allowed the future Prophet of Truth to usurp him? ...that Halo: Combat Evolved and Halo 2 take place during the Ninth Age of Reclamation? ...that virtually all Forerunner technology is powered by vacuum energy? 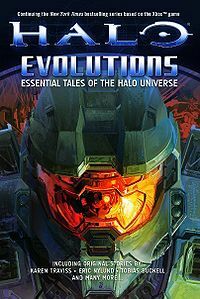 Halo: Evolutions - Essential Tales of the Halo Universe is a collection of short-stories and poems from Tor Books. Like the Halo Graphic Novel, Evolutions features stories by a variety of writers, including Eric Nylund, Tobias Buckell, Karen Traviss, Robert McLees, Fred Van Lente and many other critically acclaimed authors. Production of the anthology was begun "around Christmas" of 2008, and the book was released on November 24, 2009. The book also explores foggy corners and faces of the Halo universe. Some of Halo: Evolutions' short stories act like stepping stones to The Forerunner Saga, written by Greg Bear. An audiobook version of Evolutions is available on Amazon.com, Audible.com, and iTunes. It is narrated by Steve Downes, Holter Graham, Frank O'Connor, and Jen Taylor. Halo: Evolutions was re-released as two separate volumes with one additional story in each, as well as new cover art for each of the original stories selected from the Halo: Evolutions community art contest. The new stories Soma the Painter and Wages of Sin were added to the Volume I and II editions, respectively. Some of the stories in Evolutions have been adapted into motion comics, with Midnight in the Heart of Midlothian, The Return and The Mona Lisa animated by ONE and Headhunters by MoreFrames. Beyond is a poem that describes an individual's opinion on the Halo rings and the implications of their existence. It written by Jonathan Goff, with cover art done by Nicolas "Sparth" Bouvier. Pariah tells the story of Soren-066, a Spartan who was one of a dozen unfortunate candidates who washed out of the program due to complications arising from the biological enhancements, and the struggles he faced afterwards. It was written by B.K. Evenson. Stomping on the Heels of a Fuss tells the story of an ONI agent named Connor Brien, who is sent to investigate Brutes on Beta Gabriel. Brien eventually gets captured by Hammadus while watching the Brutes from a tree and is thrown together with the rest of the human survivors. The human prisoners are used as amusement and food. The ONI agent conspires with a spiritual guru, Dasc Gevadim, to escape. While the pack's unity slowly breaks down, the prisoners make a distraction, which gives Brien and Dasc a chance to escape. The ONI agent and the spiritual guru eventually escape from the Brutes, but Brien is killed by Dasc before the help can arrive. It was written by Eric Raab. Midnight in the Heart of Midlothian tells the story of an ODST who is put under for a surgery to remove a tumor before participating in his next mission. When the ODST awakens, he finds that he is the only human left alive on the UNSC The Heart of Midlothian after a Covenant Special Operations team has boarded and taken the ship. Living on borrowed time, the ODST has to stop the Covenant from capturing the shipboard AI and learning the location of Earth. It was written by Frank O'Connor and effectively acts as a sequel to the Halo Legends episode Prototype. Dirt follows a Harvest militiaman, named Gage Yevgenny, from his time before the Human-Covenant War as he joins first the CMA, and then the UNSC with his two friends Eric and Felicia. After joining the ODSTs, the Covenant destroy Harvest, leaving him no home to go back to. After nearly thirty years of war, he is reunited with a few of his old friends from his CMA days, but is presented with a moral crisis that eventually leads to his heroic death. It was written by Tobias Buckell, author of Halo: The Cole Protocol. It also introduces the character of the Rookie, a main character in Halo 3: ODST. Acheron-VII is a poem written by Jonathan Goff, with cover art done by Nicolas "Sparth" Bouvier. Headhunters follows the story of a two-man SPARTAN-III team, sent deep into Covenant territory to deal serious damage behind enemy lines. It was written by Jonathan Goff. Blunt Instruments follows SPARTAN-II Black Team which is given the task to disable a Covenant energy supply station. During the course of the operation, Black Team made an uneasy alliance with the Yanme'e, who tricked them into organizing their escape. It was written by Fred Van Lente. The Mona Lisa follows the crew of the UNSC prowler UNSC Red Horse as they are sent to investigate the fate of the Mona Lisa, a prison ship which has mysteriously come to rest near the destroyed Installation 04. After boarding the ship, a team of Marines discovers that the ship has been overrun by the Flood, making unexpected and uneasy alliances, and beginning a desperate struggle for survival against the parasite. It was written by Tessa Kum and Jeff VanderMeer. Icon describes the lives of John-117, the SPARTAN-IIs and SPARTAN-IIIs, and the legacy they left. Cover art was done by Gabriel "Robogabo" Garza, and was written by Jonathan Goff. Palace Hotel follows the Master Chief's movements from getting on the other side of the bridge in the Halo 2 level "Metropolis" to right before he boards the Scarab. It also discusses Master Chief's discovery of a childhood friend. The story was written by Robert McLees. Human Weakness tells what happened at the end of Halo 2, with Cortana in the clutches of the Gravemind. The Gravemind manages to break Cortana by introducing the fallacies of her existence and the purpose of her service, but through it all he cannot get her to give up one last secret. It was written by Karen Traviss. Connectivity is a poem that describes the connection between Cortana and John-117. Cover art was done by Gabriel "Robogabo" Garza, and was written by Jonathan Goff. The Impossible Life and the Possible Death of Preston J. Cole is a series of email transcripts from Codename: SURGEON to Codename: USUAL SUSPECTS, and details in length the life and times of UNSC military leader Preston Cole, including his possible death or survival during his famed last stand. It was written by Eric Nylund. The Return follows a Sangheili Shipmaster as he travels back to the human colony world Kholo, which he had led the destruction of years earlier, to reflect on his actions and look for guidance in the wake of the Great Schism. It is set after the events of Halo 3. It was written by the 343 Industries Managing Editor Kevin Grace. From the Office of Dr. William Arthur Iqbal is an email transcript from Dr. William Arthur Iqbal to his colleagues, and details the progress of their research on the Forerunner structure in Kenya. Soma the Painter is a story exclusive to the re-released Volume I edition. The story shows Soma, a Forerunner inhabitant of Seaward, witnessing the Flood returning to the Milky Way for the first time since the human-Flood war. It then cuts to the Auditor and the Prelate discussing the matter. They then send word to the Didact that "the test has begun." Wages of Sin is a story exclusive to the re-released Volume II edition. The story is the first-person narrative of the Minister of Discovery in his last moments in High Charity as it is overrun by the Flood. The cover for Evolutions Volume I. The cover for Evolutions Volume II. Full jacket artwork for Halo: Evolutions Volume I. Full jacket artwork for Halo: Evolutions Volume II. Nearly every author who was asked to provide stories for the anthology accepted the offer. Among those who declined was Greg Bear; Bear was interested in the project, though he wished to write a full-length novel rather than a short story. A few months later, Eric Raab, 343 Industries' contact within Tor Books, suggested that Bear be hired as the author of the planned Forerunner Saga. When Frank O'Connor approached Bear about writing the series, he gladly accepted the offer.